I’ve never paid much attention to Lucio Fulci having seen Zombie Flesh Eaters (1979) as a teenager and dismissed it as crap. Other Italian legends like Mario Bava, Argento on his day, and Michele Soavi caught my attention but I’ve avoided Fulci films ever since. So I wasn’t expecting much from The House by the Cemetery. I may well have been wrong about Fulci. This is an often very subtle tale with a touch of Henry James about it. The final part of Fulci’s unofficial ‘gates of hell’ trilogy after City of the Living Dead (1980) and The Beyond (1981), it also features a plot where the dead cross over into the world of the living. Dr Norman Boyle (Paula Malco) and his wife Lucy (Catriona McColl) plan to move the Massachusettscountryside. Yet the house they are moving into looks very much like the one in the photographs hanging on the wall in their city apartment in which their young son Bob (Giovanna Frezza) claims he can see a young girl (Silvia Collatina) at the window warning him never to go there. Norman hasn’t told them but he intends to investigate the murder/suicide of an old friend who had been researching the mysterious Dr Freudstein whose experiments many years ago were aimed at prolonging the lifespan of human beings. 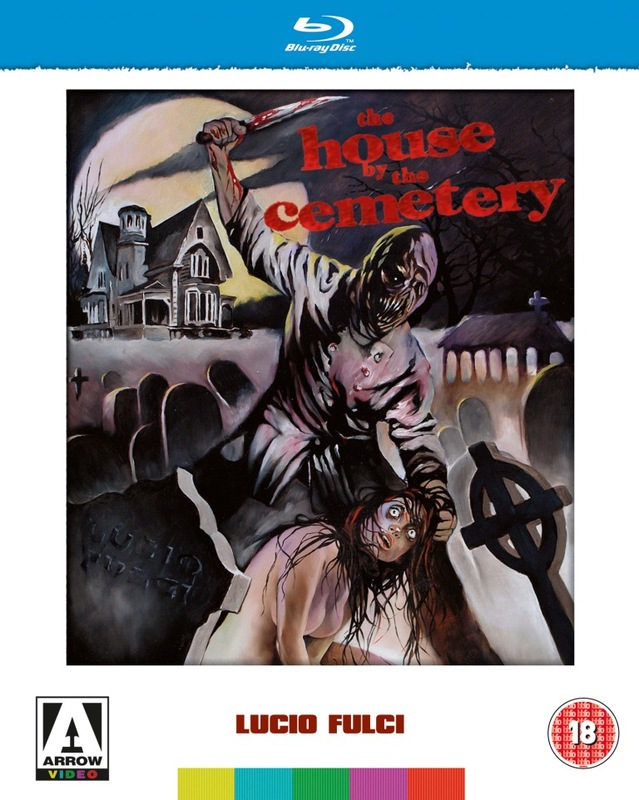 The House by the Cemetery will satisfy anybody looking for gore but it is the atmospheric otherwordly feel of the film which makes it a success. It is admittedly not entirely coherent. It has the logic of a dream. Time and time again the locals tell Normanthey have seen him before though he insists he has never visited this place at all. This ambiguity works in the film’s favour though and adds to the dreamlike atmosphere. Sergio Salvati’s cinematography brings an Autumnal feel to this sombre downbeat film. Italian exploitation films shared with their American counterparts a bleak worldview. Though this despair would give way in the United States to the cheap if not un-enjoyable thrills of the horror-comedy it never really left the Italian genre film at least until the industry began to fall apart in the 90’s. Fulci regular Catriona McCall is an effective scream queen but poor Giovanna Frezza is lumbered with horrendous dubbing on the English language version. It sounds like a fifty-four year old woman is imitating a nine-year old boy. Best stick with the original Italian language track. There is an interview with both stars on the disk in which both discuss the movie and their other work in Italian horror, as well as a wealth of extras, documentaries, commentaries, and written work to accompany the movie. Also out today from Arrow is Forbidden Zone, a cult curio from Richard Elfman and his brother Danny who draw their inspirations from the same kind of pop culture Americana as early Sam Raimi and Tim Burton but with less interesting results. Made as a showpiece for their band The Mystic Knights of the Oingo Boingo its demented college boy humour wears thin, but there are some catchy songs, and Hervé Villechaize turns up playing a trumpet. While this low-budget horror movie never quite manages to fulfil its promise it has a certain charm. 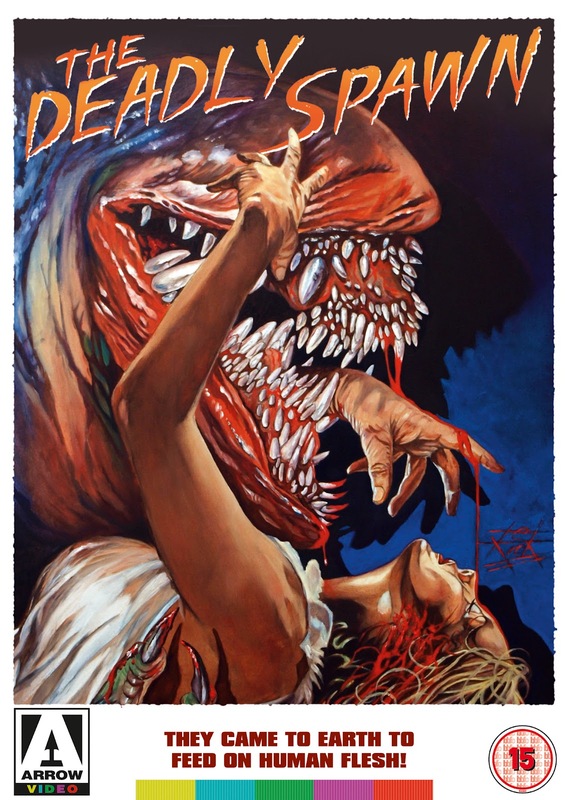 Made in the same cheap and cheerful fashion as Sam Raimi’s The Evil Dead (1981) by a bunch of amateur filmmakers in New Jersey, The Deadly Spawn features intergalactic carnivorous aliens munching on the local population. A cult favourite on VHS the film is very much of its time. It has the bleakness often found in American horror films from George Romero’s Night of the Living Dead (1968) onwards and the gross out comedy horror of the 80’s in which death is treated as an elaborate joke. The Deadly Spawn has a knowing sense of humour and is clearly made by people who love horror films and science fiction. The most resourceful character in the film is a kid who is obsessed with horror and is able to adapt when his own life turns into a scary movie. The creatures when they appear are suitably disgusting, tadpole-like with layers of teeth. Not nearly as frightening as the décor though. It’s terrifying, a mixture of garish colours and unholy shades of brown which might well inspire intergalactic visitors to think human beings are of little use except for eating or tearing into pieces. The film was a minor sensation today but now looks as hokey as the B-movies of the 1950’s. Fun though. Credit to Arrow Video they never stint on the extras. Doesn’t matter if the film is an arthouse classic like Ashes & Diamonds (Andrzej Wajda, 1958) or a daft homemade horror film like The Deadly Spawn Arrow respectfully takes the same care when putting the DVD extras together. In this case the special features are far more interesting than the actual movie. An accompanying booklet contains written work on The Deadly Spawn by film experts Calum Waddell and Tim Sullivan. Producer Ted A. Bohus provides two commentaries, one of which is a conversation with Editor Marc Harwood and basically involves them describing whose house they are filming in at that particular moment. This really was DIY filmmaking. The archive footage provided in a trio of features emphasises this. It is like watching a hairy grown-up version of Super 8 (2011, J.J. Abrams). John Dods IMDb page credits him with providing Matt Dillon dummies on A Kiss Before Dying (1991, James Deardon) and being Grace Jones Corpse Creator on Boomerang (1992. Reginald Hudlin). Since then he’s been off the radar, maybe Grace Jones got him, but there is an amusing documentary filmed in his workshop. There is also an audition reel which includes actors who didn’t get the parts they were reading for which is perhaps cruel, but not as cruel as it is funny. There are also interviews with Bohus on various low-rent TV channels, a comic strip prequel which attempts to give the film a backstory but seems more like an afterthought, and the original trailer for the film’s cinema release.